Register Your Book: Saved! 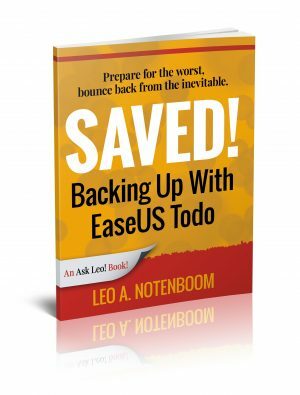 Backing Up With EaseUS Todo - Ask Leo! Thank you for your purchase of Saved! Backing Up With EaseUS Todo! That’s all there is to it. Once you’ve completed checkout you’ll have an Ask Leo! account. As long as you’re logged in to that account — using the My Account item at the top of the page — you’ll have access to the Saved! Backing Up With EaseUS Todo Owners page.